The Hands of Victory monument. Public Domain image by USAF taken from Wikipedia. Globalsecurity has more information on and pictures from this Baghdad monument, which is called "Hands of victory". Quote from site: "To celebrate his "victory" over Iran, Saddam decided to build a Triumphal Arch. The concept of a triumphal arch is a European import, without precedent in the Middle East since Roman times. The colossal Hands of Victory monument has dominated Baghdad’s skyline since the end of the Iran-Iraq war. 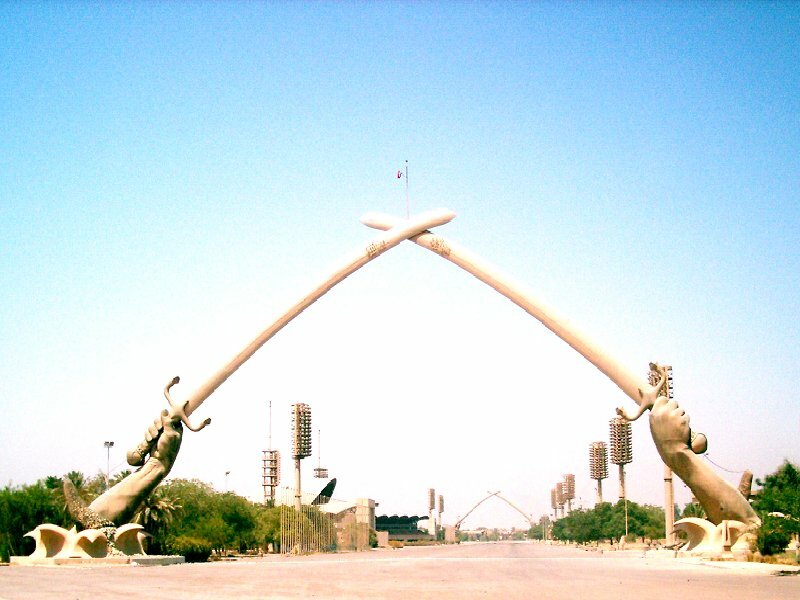 Built in duplicate, it marks the entrances to a large new parade ground in central Baghdad, towering 140 feet above the highway. The triumphal arch is shaped as two pairs of crossed swords, made from the guns of dead Iraqi soldiers that were melted and recast as the 24-ton blades of the swords. Captured Iranian helmets are in a net held between the swords. And surrounding the base of the arms are another 5,000 Iranian helmets taken from the battle field. The fists that hold the swords aloft are replicas of Saddam Hussein’s own hands. The German company that built the monument, H+H Metalform, said it was given a photograph of Saddam’s own forearms to use as a model".